The Australian government has released around 60 datasets on license terms and in formats that permit and enable mashups. The government is keen to see what developers can create with this data, so they are holding a mashup competition. Entry to the competition is now open and closes on 6 November 2009. Arek, of Australian mapping site All Things Spatial has been looking at some of the early entries into the competition. You won’t be surprised to hear that Google Maps feature prominently. A Google Map based application to locate the nearest emergency services, government services, schools and public internet etc. You can also print a Free Illustrator vector Printable Map of Sydney, Australia, exact vector street map, fully editable Adobe Illustrator, Adobe PDF, SVG, G-View Level 12 (5000 meters scale). 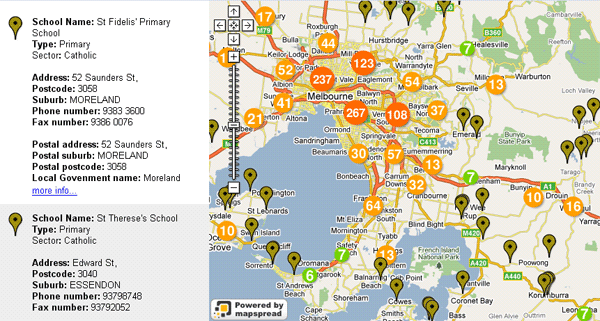 The Victorian Schools Locator is a Google Map based application, created with the mapspread map creator. The map shows locations of over 2,000 schools in Victoria. Broadband Locator is using Google Maps and Street View to display address information – visitors can enter the address and the application will show what broadband services are in their area. Geocoded List of Medicare Office Locations: a geocoded ATOM feed of Medicare offices. 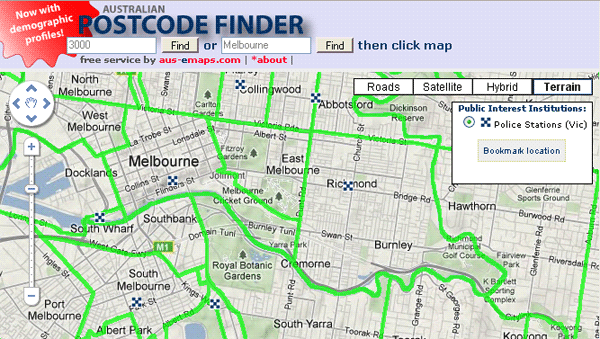 Postcode Finder is Arek’s own first entry into the contest – with postcodes and suburbs boundaries and Victorian Police Stations as POI. Arek is planning to add more POI, and data from the Australian government’s newly released datasets.